We Were Made For Each Other! 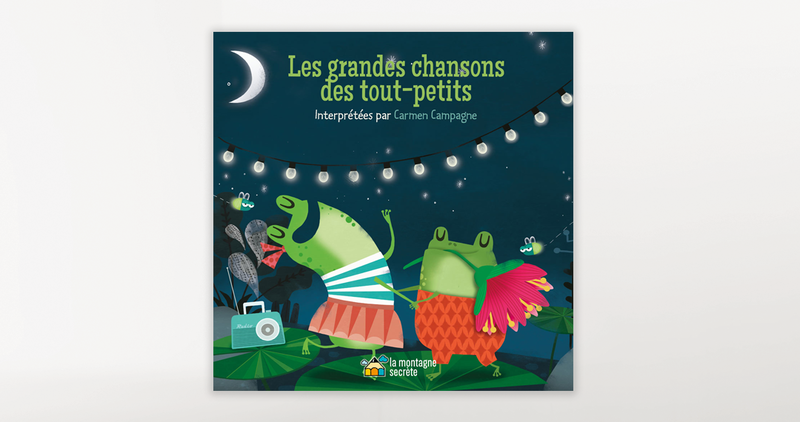 Introducing nostalgic French folk music to children for hours of singalong fun and language-learning practice, recorded by one of Canada’s best-known children’s performers, Carmen Campagne. This 10-song CD is sure to be a hit with the whole family offering just the right mix of upbeat and mellow material. It all starts with a track highlighting a banjo-playing toad who’s madly in love with a frog only to end with a tender heartwarming lullaby about little chicks leaving their nest. Popular singers Daniel Lavoie and Laurence Jalbert appear as special guests. 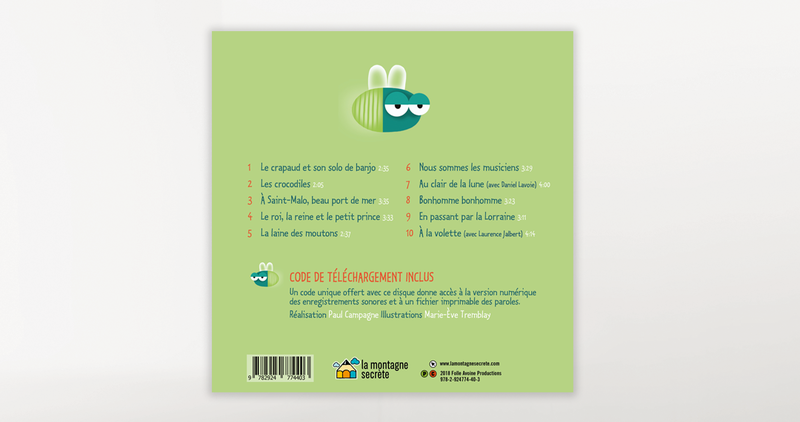 The songs: Le crapaud et son solo de banjo (The toad and his banjo solo) , Les crocodiles (The crocodiles), À Saint-Malo, beau port de mer (At St. Malo, the beautiful port), Le roi, la reine et le petit prince (The king, the queen and the little prince), La laine des moutons (Sheep’s wool), Nous sommes les musiciens (We are the musicians), Au clair de la lune (In the moonlight) with Daniel Lavoie, Bonhomme bonhomme, (Hey man, hey man) En passant par la Lorraine (Passing through Lorraine) et À la volette (Fluttering they go) with Laurence Jalbert. All recordings were produced by Paul Campagne. Cover art was created by Marie-Ève Tremblay. Carmen Campagne (1959-2018) was an educator and singer-songwriter, nicknamed “The Daycare Diva” in the height of her career in French-speaking Canada. She sold more than a million records and videos and was a four-time winner of a Félix Award. In 2014, she was appointed to the Order of Canada. CD containing 10 songs (33 minutes) and a code to download MP3 files of the recordings and a PDF printable file of the lyrics. You've switched the language and there are items in the cart. If you keep the English language, the cart will be emptied and you will have to add the items again to the cart.